Ya, sorry if I kinda scared you there for a moment but I was wondering about something. I bet a few of you venture over the the Japanese PSN on the PS3 area, and probably into home. How many of you would find it interesting if Konami did open up and add an enhanced port that could probably work with a Home space? Interested? Anybody here active enough, vocal, or have a Japanese buddy that wants to petition, suggestion, or ask Konami to do a PS3 port of Battle Rondo or Battle masters? If not somethign as semi-complex as that, then maybe just a simple Busou PSN Space? If anybody does push Konami into creating a PS3 version, and if Konami does accept I might have a second PS3 by that time . Last edited by ArcticKitsune on Sat Feb 26, 2011 2:51 am, edited 2 times in total. Re: Busou Shinki for PS3? I'd support it, Battle Masters and Battle Rondo are both quite fun to play, I still enjoy them regularly, and though I don't own a PS3 right now, it would give me reason to go out and get one. I have enough love for my girls, that seeing them anywhere new would be a great pleasure. I would be all for it. Unfortunately, rarely do you see a psp title ported to a ps3 (I can't think of any at the top of my head). It's usually the other way around (i.e. Valkyria Chronicles). I own two psp's and two ps3's so honestly, I am just grateful that they are continuing to create titles for the handheld. It would be neat to have it a Home feature, though I haven't used Home since I bought my ps3 at launch date. It would definitely give me a reason to use the feature. I would support a PS3 Battle Masters-esque game....supposing it had an "english" mode (For the text boxes and the menus; the voices can stay Japanese). 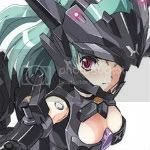 so I would like some form of Busou Shinki on PS3 , if it is PS Home , that would be awesome! a PS3 game would be better! It'd be an instant buy from me! Plus, if they have the PC portion, and the PSP game, and an anime, and a lot of other merchandise, why not throw in a PS3 port of the game? They could do a whole "Ultimate shinki master edition" and throw in the anime on Blu Ray, and Arnval and Strarf Mk2 or something. Epicusername wrote: It'd be an instant buy from me! Plus, if they have the PC portion, and the PSP game, and an anime, and a lot of other merchandise, why not throw in a PS3 port of the game? They could do a whole "Ultimate shinki master edition" and throw in the anime on Blu Ray, and Arnval and Strarf Mk2 or something.